Early Booking Offer – Book early and save up to 20% off the room rate. The Ritz-Carlton Abu Dhabi, Grand Canal is a charming property with idyllic surrounds. The glass fronted foyer provides the perfect setting for watching the sun set behind the beautiful Grand Mosque, where the intense richness of colour is breathtaking. Inspired by Venice, a beautiful swimming pool is the centre piece to this crescent shaped property. Continuing the Venetian theme, the suites and villas are palatial and lavish in style; each with a balcony and beautiful views of the evergreen gardens and water fountains. The ESPA spa hosts 16 private treatment rooms for the opportunity to unwind and rejuvenate with a signature massage. The aromas of the cuisines are enchanting and the fine dining experiences limitless. With art deco and traditional restaurants, each restaurant is fascinating and comforts your taste buds. A beautiful property with grand stair cases and the richness one expects from an Arabian hotel, this property is well located and offers entertainment for the whole family. 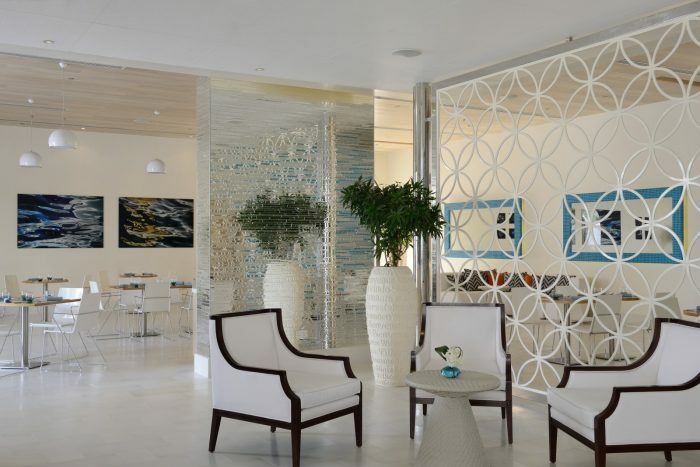 The ESPA provides rejuvenation and relaxation in a serene and meditative setting. The 2,000 square metre beach front spa offers 16 private treatment rooms, as well as outdoor plunge pools. A fully equipped gym and studio for group or private classes. The Ritz-Carlton Abu Dhabi, Grand Canal is a luxurious honeymoon resort, offering honeymoon couples to enjoy a Venetian inspired stay. The grounds of the property are beautiful and well manicured and the chandeliers in the foyer stunning. With such beautiful views of the Grand Mosque, this property embraces the Arabian and Venetian cultures, to create a well blended ambient stay. The spa is a holistic escape, offering couples treatments for you and your loves one; with a private beach and outdoor plunge pool. If you want privacy, there are private villas to retreat, each with state of the art features and fascinating surrounds. International menus grace honeymoon couples and you can savour the freshly cooked cuisines and after take a leisurely walk along the canal and take in the splendour of this property. Dining at the Ritz Carlton Abu Dhabi doesn’t leave you to get bored. The Forge – offering amazing wines with signature steak dishes, the Forge is a culinary force to be reckoned with. MIJANA – for Lebanese treats in a stylish setting the Mijana is fantastic and enriches your Lebanese dining experiences. Giornotte – little Italy comes to life in this all day dining restaurant with delightful Mediterranean treats. Dining in this vineyard, overlooking the manicured gardens is great. DOLCE – Staying true to its venetian inspiration, Dolce is ideal to enjoy full bodied flavours and gelato so rich in flavour that you could eat it for breakfast. ALBA – Afternoon Tea Parties can be arranged at the lobby and Ritz Carlton can make it a private affair too. With views of the Mosque, bring your afternoon tea party to life.